Who Needs Coffee When You Have GREEN SMOOTHIES!!! I have been absolutely loving GREEN SMOOTHIES! I used to make them all the time and when I would try to share them with someone… well let’s just say it wasn’t the most palatable experience. 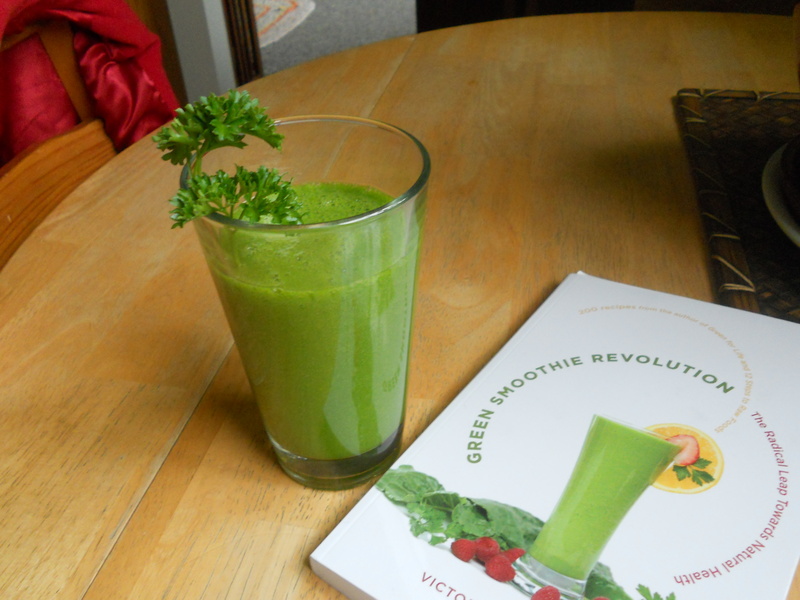 But now after reading Green Smoothie Revolution by Victoria Boutenko, the smoothies I make are amazing and other people love them too. So the smoothies I used to make were out of spiralina, wheat grass, kale, maybe an apple. Yes they are good for you, but they tasted a lot like a grass smoothie. It was actually my brother who said he was reading Green Smoothie Revolution, and actually making the smoothies and liking them. He had better energy and digestion from consuming 1-2 quarts of green smoothies/day. I had heard of this book before and I just assumed that it would be more of my crazy super green smoothies that tasted a bit too green. So I borrowed his book and actually followed some of the recipes and… WOW!!! So delicious, so fruity, still a beautiful green color (at least the recipes that don’t have blueberries or beet greens), and I keep wanting more. I have been consuming green smoothies every day for the past 2 weeks and I can tell you, even living on the Oregon coast with the lack of sunshine my energy is better than if I were having a couple shots of espresso!!! experiment to find recipes that you love!! !